I cannot recall much if anything from Alice in Wonderland, apart from the fact that I absolutely hated it. Therefore, it should come as no surprise in what is turning out to be the worst year in film in recent memory, that a sequel to a very bad film is what audiences actually want. Then again, given that same audience also voted to have either Donald Trump or Hillary Clinton be the next President of the United States, they might actually have wanted an even worse sequel to an already bad film (American taste and logic having left long ago). 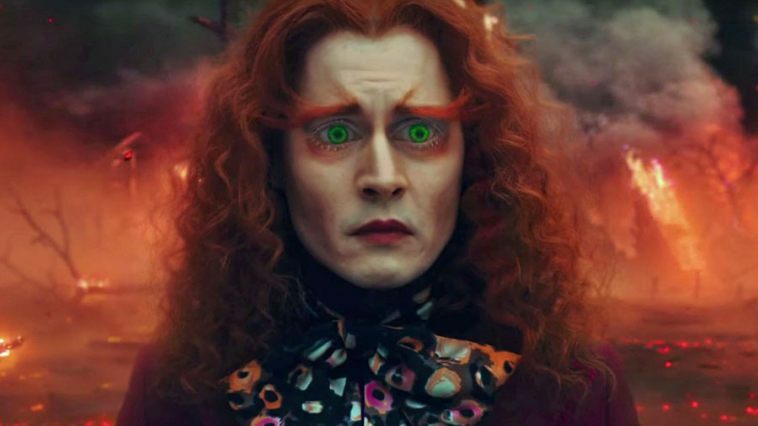 Alice Through the Looking Glass decided that we needed a giant case of 'the feels', to be sad for such characters as The Mad Hatter and even the Red Queen. It's not their fault they grew up to be what they became...they were made that way by this cruel, cruel world. We need to CARE about them, the film says. Pity the film makes no case for us doing so. It's been three years since Alice Kingsleigh (Mia Wasikowska, aka My Secret Love) sailed and became one of the most successful ship captains in private business. Oh sure, why not...makes perfect sense for a woman and seamen to mix. Her latest journey to the Orient ended, she yearns to make one final journey, but her mother (Lindsay Duncan) has bad news. Alice's company has been taken over by her ex-fiancée, Lord Hamish Ascot (Leo Bill), and he intends to sell her ship, the Wonder, in exchange for the Kingsleighs to get their home back. At the Ascot mansion, Alice, in her Mandarin-inspired ensemble, is distraught over all this. However, there is hope, as the caterpillar-turned-butterfly Absolem (Alan Rickman, in his final role), leads her to a room in the estate, where she goes through the looking glass back into Underland. There, she meets all her old friends: Queen Mirana (Anne Hathaway), Tweedledee & Tweedledum (Matt Lucas), the White Hare (Michael Sheen), the Cheshire Cat (Stephen Fry) and the Dormouse (Barbara Windsor). They give Alice an important mission: save The Hatter (Johnny Depp)! He's been sad and a bit out of it (even for him apparently) ever since he found a tiny hat he had made many years ago. He's convinced that since his hat survived, so must have his family, whom he believed dead at the hands of the Jabberwocky and the evil Red Queen (Helena Bonham Carter). Alice can't convince him of the impossibility of this, so now she has to go back in time to prevent the Hatter's family to die. I already smell timey-wimey idiocy coming down the pike. First though, she must get the Chronosphere, the device that controls time, from Time Himself (Sasha Baron Cohen). Time isn't about to hand that over to anyone, let alone Alice. He's turned down the requests to have it from his girlfriend, the Red Queen herself. Time cannot be rewritten (which goes against all Doctor Who theology, but that's for another day). Alice decides to steal the Chronosphere anyway and head on back to that fateful day, with Time in hot pursuit to set things in order. On that fateful day, she learns how the Red Queen (real name Iracebeth) got such a big head (and how the Hatter got on her bad side PLUS shamed his family). The young Mirana recalls that Eracebeth hasn't been the same since "that day". Well, Alice figures that is she changes whatever "that day" was, things would change for the better for everyone. She goes further back to stop whatever happened at the stroke of six, only to discover rather than stop it, she caused it! A quick sojourn to her world (where she's diagnosed as suffering from 'female hysteria') causes her to escape from the looney bin and go back through the looking glass, where she discovers that the Hatter's family weren't killed, but merely captured by the Red Queen...and turned into the size of ants. Exactly WHY the Red Queen opts to hold the Hatter's family hostage for what I imagine must have been twenty to thirty years without ever doing anything with them (or threatening the Hatter over them) is just one of the many questions Alice Through the Looking Glass never bothers to answer, but there it is. Eventually, while Time is weakening, a rescue attempt is made...which not only fails but lets the Red Queen get the Chronosphere. She uses it to go back to the day of her accident, to confront her younger sister who lied about eating tarts and framing Iracebeth for the crime. Pity that in her anger the Red Queen didn't realize what would happen if she met her younger self. Soon all Underland starts going under, and it's a race to get the Chronosphere back to its rightful place or the world will end. Back in the present, Alice's mother tells Lord Ascot off and ends up joining her daughter at sea, with First Mate James Harcourt (Ed Speleers) to join them in more adventures. Alice Through the Looking Glass is a sheer mess of a movie: bombastic, overblown, frenetic, incoherent, and so convoluted I think most people will leave with a slightly puzzled reaction, wondering what exactly this...thing, was. Screenwriter Linda Woolverton has studied in the Steven Moffat School of Screenwriting, because the story so wildly depends on you a.) caring about 'feelings' over plot and logic, and b.) going back in time to get things right. Alice Through the Looking Glass stubbornly insists that we really care about how sad the Hatter is, or how the Red Queen is just a misunderstood person and not just a loud, evil Queen who likes to lob people's heads off just because she likes it. Moreover, as much as it tries, Alice Through the Looking Glass fails spectacularly to make us care about any of them. The film never made a case as to why we should care anything about the Hatter's pain over the loss of his family (and as a side note, I think it would have been better if they had died and Alice led him to accept that and move on rather than have them magically come back). Same goes for the loud, obnoxious Red Queen. I doubt Underland would have fallen apart if the Hatter had died of a broken heart, or things improved if the White Queen had confessed to eating the tarts (for Iracibeth was pretty 'irascible' to begin with, with or without a head injury and tears). I truly feel for the actors in this dreg, for the film is cluttered with genuine talents (and Sasha Baron Cohen). I have never subscribed to the idea that SBC is a comedic genius, and while I wasn't puzzled as to why Time had a Germanic accent (a nod to Swiss watches? a comment on German efficiency? ), I found him highly mannered and excessively idiotic. I really don't want to go into Johnny Depp's performance. Suffice it to say he made a nice chunk of change and has no interest in his artistic reputation. Oh, Mia...I still love you, even when you're in horrors like this. I think you try, you really do, to make things work, but director James Bobin's singular task was to get out of the way and let Alice Through the Looking Glass be about how big, how loud, how CGI everything could be. As we race frantically through one odd sequence to another (the entire hospital scene was pointless, unless it was to give Andrew Scott something to do while he waits for Sherlock to bring Moriarty back...again). Going back to the Steven Moffatization of Alice Through the Looking Glass, IF Alice interacted with the Underland characters when they were younger, wouldn't they have some memory of it all? Did restoring the Chronosphere erase what had apparently happened in the past (and/or wiped out their memories of having met Alice in the past)? How exactly did the Hatter's family survive all those years in the ant farm with no food or water? Being so small, how'd they see the Hatter and make a sign to him? Like in any Moffat-Era Doctor Who episode, logic is irrelevant...so long as you cried. 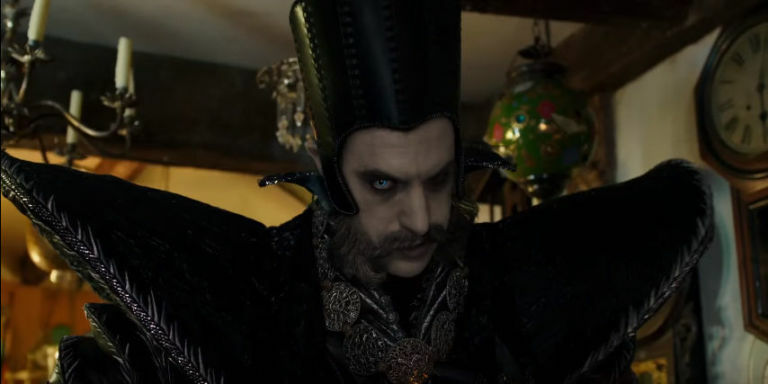 It's not as if there were things I didn't actually enjoy in Alice Through the Looking Glass. At the Tea Party that Time crashed, some of the time-related puns were funny (the Cheshire Cat appearing on top of him and declaring, "I'm right on time", and the Hatter taking Time's hand and telling everyone, "I've got Time on my hands"). I liked that the Kingdom was called "Wit's End". I like that Iracebeth had this Duchess of Windsor-type hairdo. Honestly, Alice Through the Looking Glass is just a terrible film: loud, overblown, nonsensical (in a bad way versus Lewis Carroll's good nonsense). It isn't even the story Carroll told (no Walrus, no trial, nothing really). It's just a waste of everyone's time and talent. I say smash this glass and throw it in the trash.